When we say Rosslyn has a growing residential population, we aren't just talking about humans. Pets, of course, have been among the many new inhabitants of zip code 22209. To help make them feel at home, in 2017 the Rosslyn BID installed a pet garden at North Kent and 19th Sts., not far from several residential properties. Formerly known as Kent Street Island, it isn't a huge space, but it makes good use of an 800-foot patch of land on what was once a nondescript traffic median. With Adirondack chairs, attractive landscaping and a pet waste station, it's been just the green space pets and their owners needed. Thursday, April 11, which is National Pet Day, The Rosslyn BID will host the Grand Opening of Rosslyn's second pet garden at a traffic island near the intersection of Nash St. and Wilson Blvd. The approximately 500-square-foot pet garden includes a new pet waste station. It is landscaped with pear trees, boxwoods and crape myrtles. It also has Adirondack chairs so pet owners can relax and take a break. "With more and more residents in the neighborhood, we realized we needed to get creative in providing spaces for their pets," Victor Carcamo, the Rosslyn BID's operations director, said. "We launched our first pet garden in 2017 and it's been very successful, so that's why we've added a second. We love our furry friends, and we are glad to give them places where they can go." Be sure to come check out the new Nash Street Pet Garden on Thursday, April 11. From 4-6 p.m., Rosslyn BID Ambassadors will be there handing out treats. And, of course, bring your pets! 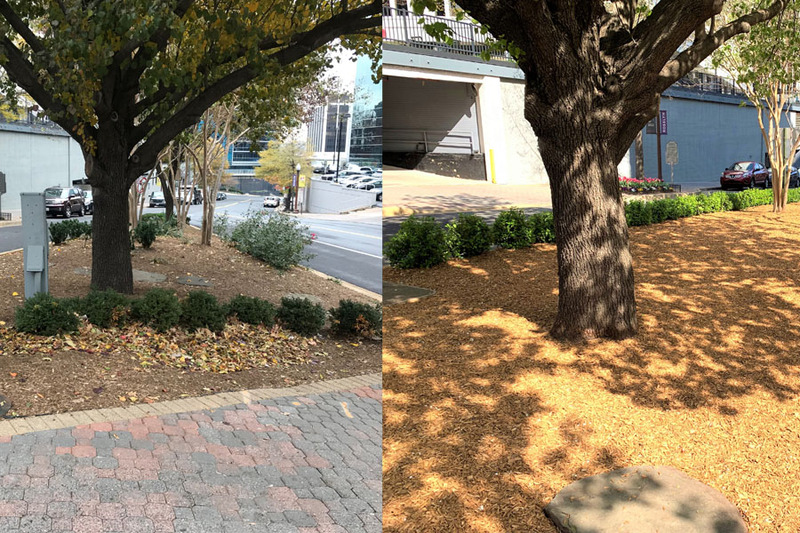 "Before" and "After" photos of the new Rosslyn pet garden at Nash St. and Wilson Blvd. The Rosslyn BID team mulched a 500-square-foot traffic island and added a pet waste receptacle and landscaping to make the space inviting for pets and their owners.